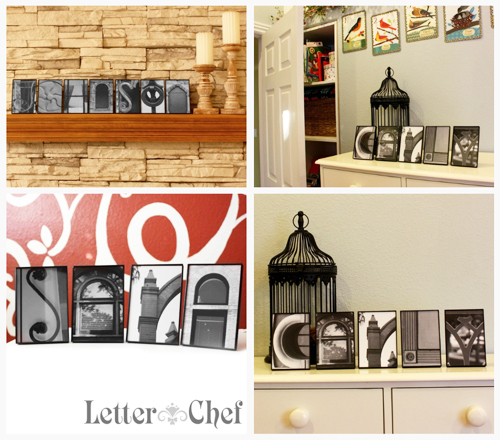 ♥ Sponsor Giveaway: $66 value from Letter Chef! ♥ CLOSED! a quirky redhead that loves all things typographic. Living in Southern California, she has access to an assortment of fun and beautiful photo opportunities. She has studied typography and photography and is able to combine the two in harmonious design. Just like a great chef, she takes great care in pursuing the right “ingredients” for her projects. The outcome is a visual feast that leaves you craving more. The best part? No calories! Now You could be The proud owner of this Beautiful piece of Art Valued at $66! These Frames would be Perfect for a unique Wedding, Anniversary or Birthday Present!! *Remember- Elissa will be doing plenty of discount codes through Facebook! I absolutely fell in love with the Letter 'S' for obvious reasons! Gorgeous! And it'll look so pretty in my new room! Thanks for the giveaway, she has beautiful art. I love the "LOVE Unframed 8×10 print" !!! I can't cook. So get some bread, butter it up, add cheese and grill. I love the letter E. Also the framed joy! How creative! I love the letter P and the family names! I like Letter Chef on FB! My favorite meal to make is BBQ pulled-pork sandwiches because it's sooo easy, and everyone loves it. You just put your pork loin in your crock pot in the morning, cover it with your favorite bbq sauce, then cook all day! Serve on buns. Aside from the name prints I love the "love" unframed and the letter P 4×6. Very cool. I liked the Letter Chef on fb. My favorite meal to make recently has been fajita soup. I liked to make it so much my husband asked that I change it up a little. ;) But it's very easy and super tasty. I like the individually framed letters, you could do so much with them! Love this recipe, it's great for potluck's AND you get one to put in the freezer for later! From LaGrange, Georgia, Kim Rocker writes, “This is an easy dish to prepare ahead of time, refrigerate and bake just before company arrives.” Canned soup makes this casserole creamy but it still cuts well for serving. TIME: Prep: 20 min. Bake: 55 min. Cook pasta according to package directions. Meanwhile, in a large skillet, cook beef over medium heat until no longer pink; drain. Stir in spaghetti sauce and tomato sauce. Remove from the heat. Drain pasta. Combine soup and sour cream. In two 8-in. square baking dishes, layer half of the meat sauce, pasta, soup mixture and cheese. Repeat layers. Cover and freeze one casserole for up to 3 months. Cover and bake the remaining casserole at 350° for 55-65 minutes or until cheese is melted. To use frozen casserole: Thaw in the refrigerator overnight. Remove from the refrigerator 30 minutes before baking. Bake as directed. Yield: 2 casseroles (6 servings each). I love the curvy P! How freakin cool!!! I think the little individual ones are awesome too! I am Letter Chef Facebook Fan. My favorite recipe is Italian Sausage in a cream sauce. Add fresh chopped parsley, basil and oregano just before sausage is almost done. Cook until reduced. About 1 hr. Add heavy cream to desired consistency and let reduce about 30 min. Serve with Rigatoni or past of choice!!! I love the letter N. It's my favorite letter and Elissa has photographed it beautifully! Thanks for the great giveaway! I like Letter Chef on facebook! My favorite recipe is ranch turkey burgers. One pound ground turkey mixed with one packet of hidden valley ranch dip (dry) and 1 cup shredded chedder cheese and 1/2 cup sour cream. Mix well, add salt and pepper to taste and form into patties. Grill until completely cooked, turning once. Serve on whole wheat buns with lettuce and tomato slices…yum! OH PLEASE!!!!! PLEASE PLEASE PLEASE!!!! I was SO downtroddened and distrought last time I lost. PLEASE MAKE ME A WINNER!!!! haha. My favorite remains the X….and actually the A from the eifel tower thing. I would love to get one for my baby London! Or maybe just all of us. Ahh!! So cute! Please! I will say a prayer. And my favorite thing in the world is to bake. I have many many good recipes for you. Cookies, pies, brownies, cakes…yum. I'll just give you one recipe on the top of my head…. 1. In a small saucepan over low heat, combine the cornstarch, cold water, sugar, soy sauce, vinegar, garlic, and ground black pepper. Let simmer, stirring frequently, until sauce thickens and bubbles. 3. Using scissors, remove any pieces of fat from each chicken thigh. Place chicken pieces in a 9×13 inch baking dish sprayed with Pam cooking spray. Pour 1/2 half of the sauce over the chicken, brushing each piece so it is coated. 4. Bake in the preheated oven for 30 minutes. Turn pieces over, pour on remaining sauce, and bake for an additional 30 minutes, or until chicken juices run clear. Cool stuff! I like the "love" individually framed. I could give you loads of recipes, but the one that has been an easy hit for everyone I know is italian chicken. Super easy. Put boneless, Skinless chicken breast in the bottom of a baking pan. In a bowl combine one large onion and sliced mushrooms (amount depends on how much you like of both of these two items) add 1 tbsp worcestershire and 1/2 bottle of italian dressing. Bake at 350 until chicken is cooked through. Super yum, super easy. Always a good combination! I love anything customized; it makes your home so much more "you". Thanks for sharing this link…. I'm a FB follower of Letter Chef! I also totally love the LOVE Unframed 8×10 print. The letters are gorgeous! The Dr. Seuss qoute is one of my favs. The only thing is that Elissa has 'Suess' spelled wrong. It's actually 'Seuss'. Sorry! I hate to point out oopsie's, but I figure she might want to know. 1/2 c butter or marg. Cream butter and peanut butter with sugar. Add beaten eggs, melted chocolate & flour which has been sifted with baking powder & salt (yes, old recipes say 'sift'!!). Spread in greased 13×9 pan. Bake @ 350 degrees for 35 mins. Check to see if done with toothpick. my kids are happiest when i keep it simple. we aren't monring people, so we like buttermilk pancakes and sausage for dinner. i usually top them with fruit, or serve fruit and yogurt parfaits on the side. somehow a dollop of whipped cream on top makes it all a little special. My favorite is the letter A! I really like the Christmas JOY print. love the JOY Christmas Alphabet Photography decorations et too! The letter S of course! :) And the Christmas Joy too. i love 'love' and 'sara' and all the varieties of 'S' yes! much to inspire! a fave meal to make? i don't FB – is there another way that counts? Prepare macaroni by following package directions. Drain macaroni noodles and salt and pepper to taste. In a large mixing bowl, combine cheddar cheese, cottage cheese, sour cream, egg and salt to taste. Stir well. Gently stir in cooked macaroni. Lightly grease a 2 quart baking dish. Carefully pour the macaroni and cheese mixture into the baking dish. Bake uncovered for 45 minutes. Remove from oven and let sit for 15-20 minutes before spooning into your plate. Well, I like the Letter A 4×6 Individual Black and White Print! Simple but elegant. I like the R. I like how it's used from a park bench!! So cute! as for the recipe. It's a super easy one!! plus, one packet of dry onion soup mix. pour over chicken and bake until done. When you try it, come over to my blog and let me know how you liked it. that my friend is my favourite dinner. I love the individual framed letters! I would love to put 'Murphy" on our Mantle, or give 'Funk' to our best friends at their wedding in June! I liked on Facebook as well! It was so hard to decide what recipe to share….so here is dinner and dessert, Southern Style! Enjoy! *You may serve over rice if you like. Red Velvet Brownies with White Chocolate Frost. Butter and flour an 8 x 8 cake pan. In a small bowl, combine cocoa powder, red food coloring, and 1 teaspoon vanilla to create a paste. In the bowl of an electric mixer, cream butter and sugar until fluffy. Add eggs one at a time, then add remaining teaspoon of vanilla. With the mixer on medium speed, add in cocoa powder mixture. Beat until batter is completely red. (If at this time your batter is NOT red, you can add a little more food coloring if desired. Color will depend on brand.) Add flour and salt, mixing until just combined. Fold in chocolate chips. Spread in the 8 x 8 pan. Bake for 25-30 minutes, or until toothpick inserted in center comes out clean. Let cool completely before frosting. Cream butter in an electric mixer until fluffy, then add vanilla. Slowly add in powdered sugar 1/2 cup at a time with the mixer on low speed. Add in melted white chocolate and beat until incorporated. To reach desired consistency, add in milk 1 teaspoon at a time with mixer on low speed. If frosting becomes too liquidy, simple add additional sugar. one of all time fav…. carne asada tacos. yum. and, girl, here is my most prized baking recipe– the most amazing chocolate chip cookies IN THE WORLD. With a last name that begins with "W" of course I love her "W 4×6 black and white" art! I'd love to win her work! Hungry? Let's see what I can find here…. How about my "Saucy Chicken & Pasta"? *Stir in remaining 1/4 cup margarine, mushrooms and peas; cook 2 minutes or until chicken is cooked through. *Stir in hot cooked noodles and cheese, mixing it all together until cheese is melted. Season to taste with salt and pepper. 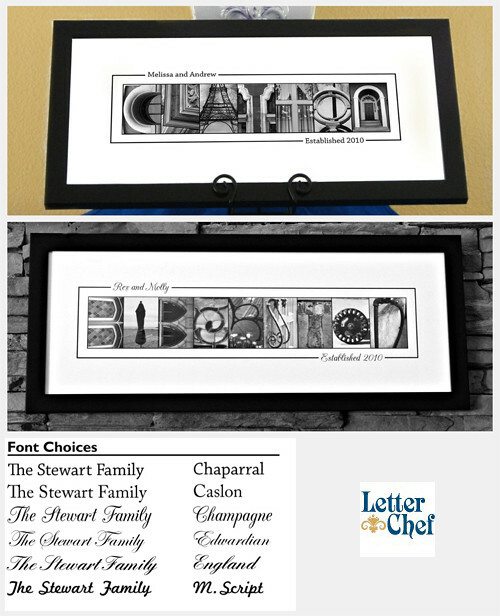 My favorite is the family name prints…..I have the perfect spot for one of those in my house!!! Since Christmas is my fave holiday…I'm really liking the "Joy" Christmas Decoration. I'm now a follower of the Letter Chef on Facebook. PW's Mini Meatball Sandwiches are one of my faves! Actually making them tonight! I also like the Letter I 4×6 Individual Black and White Print. I Follow the Letter Chef FaceBook. In medium pot heat oil over medium-high heat. Add onion; cook, stirring, until tender, 8-10 minutes. Add tomatoes, oregano, salt, garlic powder, pepper and 1 cup water; bring to a boil. Reduce heat to low and simmer, uncovered, 30 minutes. Preheat oven to 350 degrees F. In bottom of 13'x9' baking dish spread 1 cup sauce. Arrange 3 noodles on top of sauce. Lay 1/3 of spinach on top of noodles. Sprinkle 1/3 of cheese on top of spinach. Repeat twice. Pour any remaining sauce over top. Cover with foil and bake 45 minutes. Remove foil; baked uncovered, 15 minutes. Remove from oven; let stand 15 minutes to set. I love the "LOVE" photo collage with the quote by Mother Teresa- we all have so much to learn from her! A woman who exemplified love and found it in the slums of Calcutta. Like Mother Teresa the Letter Chef finds love in the most unexpected places in this photo collage. For those of us who are in love, it is the day to day moments where love can most often be overlooked but also where it can be found most. -In a saucepan, pit in the oil and chopped onion, turn on the heat to medium; saute until onion is a very pale gold. -Add the carrot and celery and cook at lively heat for another minute, stirring to coat the veggiees well. Taste and correct for salt. Pour on cooked pasta and mangia, mangia! Serving suggestion: serve with a side salad of arugula, artichoke hearts, lemon juice, olive oil, and parmesan shavings for a light and refreshing summer meal! i love the art work with Love framed! like on fb under my blog name! my favorite meal to make is fairly easy! sweet and sour chicken with roasted potatoes with onion and cushed garlic!